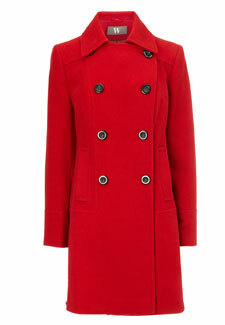 Q: I am looking for a bright red coat I can wear to work and out and about at the weekend. Have to you seen any on the High Street? A: I’ve see the perfect one for you – this reefer coat from Bhs. Shop now and you’ll get 30% off coats and this style has been reduced from £65 to £50. The classic double-breasted style will work brilliantly for the office and for the weekend teamed with jeans and knee high boots as well as for smarter occasions.